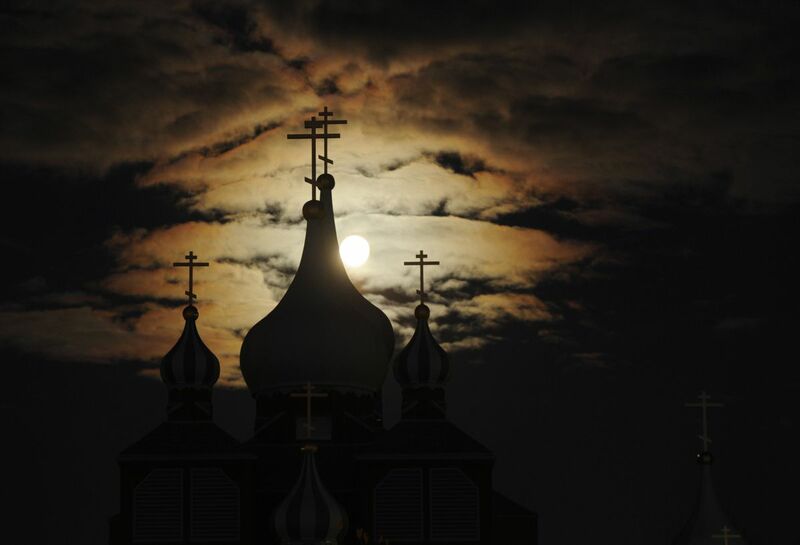 BOB HALLINEN / Anchorage Daily NewsThe full moon rises over St. Innocent Russian Orthodox Church in east Anchorage on Tuesday evening October 11, 2011. David Ramseur, former aide to former Govs. Steve Cowper and Tony Knowles, as well as former Sen. Mark Begich, has brought some new attention to Russia's Trans-Baikal region with his recent book recounting his experiences in establishing friendly relations with people there in the summer of 1988 and after, "Melting the Ice Curtain: The Extraordinary Story of Citizen Diplomacy on the Russia-Alaska Frontier." That region, Trans-Baikal, or the Russian Far East (a federal district), comprising the area east of Irkutsk and the Lena River, and north of Mongolia and Vladivostok, including the cities of Chita, Yakutsk, Magadan and Petropavlovsk-Kamchatskiy on the Kamchatka Peninsula, has its own long, remarkable history, one known little if at all to us folks just across the Bering Sea and the International Dateline. Inhabited by various indigenous people, including Chukchi, Koryak, Yukaghir and Siberian Yuit, among many others, Russians penetrated the region in 1640s, pushing eastward from the Urals in search of commercially profitable fur bearers, sable (marten) above all. Russian trappers and Cossacks established a post on the Sea of Okhotsk, in 1647. This so unnerved the Chinese in the Amur River basin that they forced the Russians to accept a border between Siberia and China far to the north of where it is today along the Amur. When, in 1728 and 1741, Vitus Bering sailed east from Kamchatka in search of North America (his ship, St. Peter, and the companion ship St. Paul, captained by Alexi Chirikov, reached the North American mainland in July 1741), the expeditions he commanded first explored in the Trans-Baikal region, from Irkutsk to Yakutsk, and then to Okhotsk. During the Crimean War, 1854-1856, between Russia and an alliance of England, France and the Ottomans, a combined naval fleet attacked Petropavlovsk-Kamchatskiy. They were driven off by Russian forces commanded Dimitri and Alexander Maksutov. Anticipating a new assault, the Russians subsequently withdrew by land, to the mouth of the Amur. Dimitri Maksutov went on to become the last governor of Russian America before its purchase by the U.S. The Russian Revolution of 1917 ended Nicholas' reign, and this is where the history of Trans-Baikal gets interesting. A variety of factions and forces vied for power following the overthrow of the Romanovs, and a Bolshevik victory was by no means inevitable or assured. Among others, many patriotic, anti-communist groups coalesced as the White Movement with a power base in Trans-Baikal under Admiral Alexander Kolchak. Nine countries allied with Kolchak in the east to fight the Bolsheviks; they included Japan, the United States, the United Kingdom, Canada, France, Italy, Czechoslovakia, Poland and China. In August 1918, 3,000 American troops dispatched by President Woodrow Wilson landed at Vladivostok. Eventually their number would grow to almost 8,000. (Another 5,000 Americans fought in Archangel and Murmansk in the northwest.) Their primary task was to operate the Trans-Siberian Railway and to protect American property that had been sent to Siberia to aid Kolchak in his fight against the Bolsheviks. This American intervention in the Russian civil war was a disaster. The commander, Major General William Graves, following Wilson's mandate, tried to limit his troops' involvement in the fighting. At the same time their equipment was poor (for example, water-cooled machine guns were useless in the subzero temperatures), and supplies inadequate and faultily distributed. After 19 months, the Americans withdrew, having suffered 189 casualties and much frustration for the effort. The Bolsheviks drove the last of the allies out of Trans-Baikal in 1923 and Soviet control effectively closed the region, including occasional Native contacts between the Diomede Islands before 1948, until the thaw which Governor Steve Cowper seized upon in 1988 — as Mr. Ramseur relates in his illuminating book.